I guess, since I have done it for two years now, it's tradition. 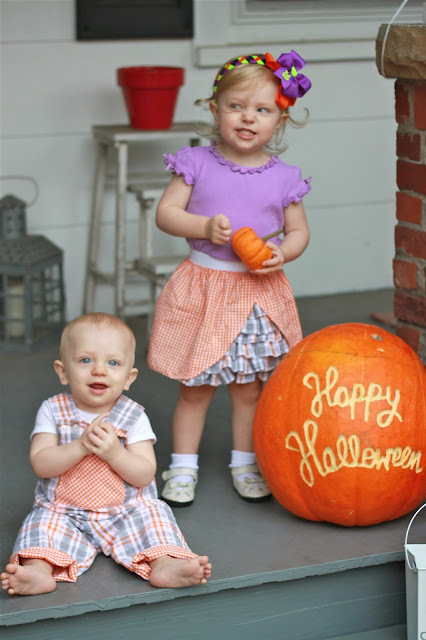 Yup, just like last year - I made my kiddos some daytime Halloween outfits that will be used again on Thanksgiving. I made Evelyn's skirt using this tutorial and this tutorial. I wanted to make a skirt both ways, and figured, let's just combine 'em. I opted for a pocket instead of the button placket to decorate his overalls, and since the tutorial and pattern calls for *almost* a full lining, I went ahead and did a full one. So now, they are REVERSIBLE. If you're already making them it's like two more steps. I promise. Not that hard. ...and we continued the baby in a pumpkin tradition too.